On a sunny July day, Austin McKee E'17 frantically types out code under a towel that keeps the glare of the bright San Diego sun off of his laptop screen. Will Stewart E'18 has just reassembled the aluminum and plastic robot that McKee now programs in a tent next to a pool larger than a football field. This is the U.S. Navy's TRANSDEC facility, home of the annual Association for Unmanned Vehicle Systems International (AUVSI) RoboSub competition. Meanwhile, Kelsey Evezich E'17 works out the final pieces of a sonar algorithm, while Sameer Khan E'19 designs and 3D prints some parts that have broken and need replacing. All in a day's work at RoboSub. AUVSI RoboSub is a robotics competition in which student-designed robots try to best complete an underwater obstacle course. These robots take on underwater obstacles ranging from navigating through a field goal, to opening a box underwater and dropping a payload inside, to locating an object emitting ultrasonic pulses. Robots in the competition are fully autonomous— there are no drivers. Once the competition has begun, the robots must rely on their sensors and programming to complete the course, with no human input allowed. 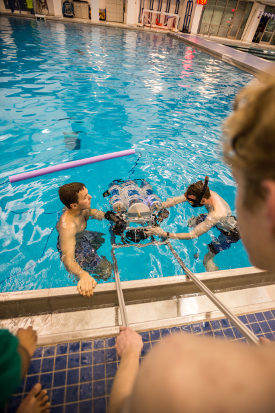 The difficulty of implementing the artificial intelligence (AI) required to complete such an obstacle course and the challenging design constraints of an underwater vehicle make it one of the foremost college-level technical challenges in the world. Saturday mornings and Wednesday nights, the Foundry is bustling with budding roboticists. While the club's lab in the Foundry is almost twice as large as the lab it was housed in before kicking off RoboSub in 2014, the room is still packed with people, machines and tools. The hardware teams' work spans the entirety of the space, and the software teams overflow into the Foundry's shared work area downstairs. 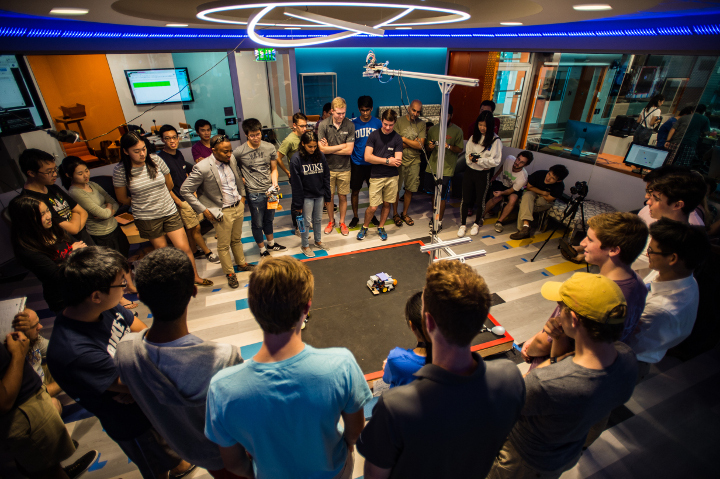 Duke Robotics Club has become an opportunity for students all across Duke—Pratt, Trinity, ME, ECE, CS and Math—to innovate the future of unmanned vehicles and AI. The club is split up into four teams—mechanical, electrical, software and deployment—each contributing a vital component to the final product. The mechanical team is responsible for designing and building the robot's chassis: its frame, waterproof capsules and actuators. At this meeting, Nikhil Ravi E'20 is designing and simulating parts for a future design with CAD software, while Trishul Nagellani E'20 files down an aluminum bracket that he has just finished machining. Over at the electrical team's lab benches, the work is similarly varied, as the Electronics team is responsible for all sensing, computation and power delivery systems. Jeremy Morgan E'20 solders resistors onto a protoype board, carefully inspecting his workmanship after each solder joint is completed. Neil Dhar E'20 has one of the robot's several cameras hooked up to an oscilloscope as he analyzes the impact of the robot's waterproof connectors on the camera's signal. 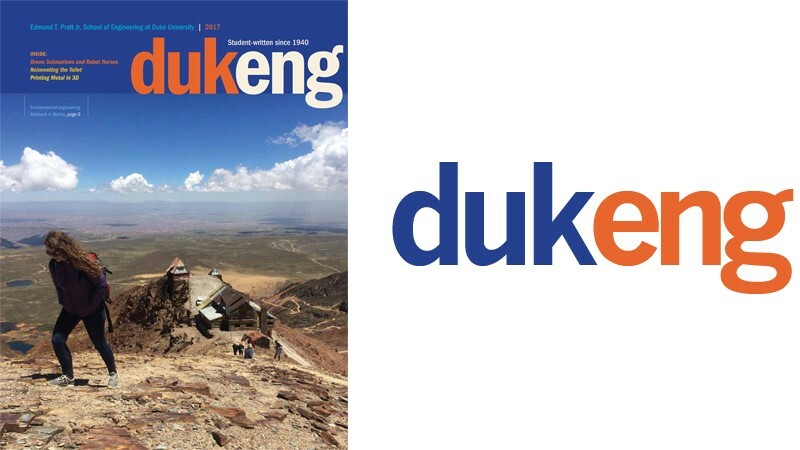 On the second day of the semi-finals, the mood in the Duke Robotics Club tent at the Navy's TRANSDEC facility was tense. The day before, the first round of a "best of two" semifinal competition, Leviathan sat motionless in the water as it was supposed to be competing; due to a glitch, the autonomous motion planning routine was never activated. With all the pressure on the second day, Leviathan passed through the field goal, grazing the colored buoy array, before passing through the channel and surfacing just outside of maximum-point area for finding the ultrasonic pinger. The result? 14th place out of 50 teams, one of the best performances of any rookie team. Almost a year since Leviathan first entered the water, the team is hard at work getting ready for RoboSub 2017. "This year, we're ready to earn our spot in the finals," said former club president Logan Rooper E'17. 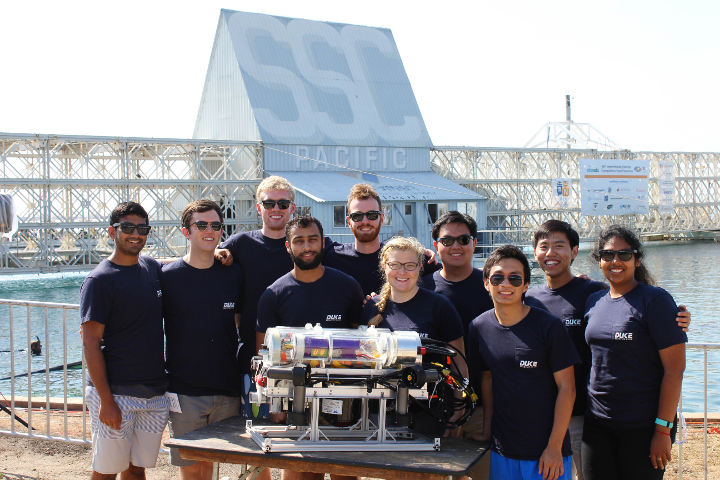 "We're ready to meet goals that we set when we restarted the RoboSub project in 2014." Will Stewart is a junior studying electrical and computer engineering.